When human cells enter mitosis, chromosomes undergo substantial changes in their organization to resolve sister chromatids and compact chromosomes. To comprehend the timing and coordination of these events, we need to evaluate the progression of both sister chromatid resolution and chromosome compaction in one assay. Here we achieved this by analyzing changes in configuration of marked chromosome regions over time, with high spatial and temporal resolution. This assay showed that sister chromatids cycle between nonresolved and partially resolved states with an interval of a few minutes during G2 phase before completing full resolution in prophase. Cohesins and WAPL antagonistically regulate sister chromatid resolution in late G2 and prophase while local enrichment of cohesin on chromosomes prevents precocious sister chromatid resolution. Moreover, our assay allowed quantitative evaluation of condensin II and I activities, which differentially promote sister chromatid resolution and chromosome compaction, respectively. Our assay reveals novel aspects of dynamics in mitotic chromosome resolution and compaction that were previously obscure in global chromosome assays. Palbociclib is a CDK4/6 inhibitor approved for metastatic estrogen receptor‐positive breast cancer. In addition to G1 cell cycle arrest, palbociclib treatment results in cell senescence, a phenotype that is not readily explained by CDK4/6 inhibition. In order to identify a molecular mechanism responsible for palbociclib‐induced senescence, we performed thermal proteome profiling of MCF7 breast cancer cells. In addition to affecting known CDK4/6 targets, palbociclib induces a thermal stabilization of the 20S proteasome, despite not directly binding to it. We further show that palbociclib treatment increases proteasome activity independently of the ubiquitin pathway. This leads to cellular senescence, which can be counteracted by proteasome inhibitors. Palbociclib‐induced proteasome activation and senescence is mediated by reduced proteasomal association of ECM29. Loss of ECM29 activates the proteasome, blocks cell proliferation, and induces a senescence‐like phenotype. Finally, we find that ECM29 mRNA levels are predictive of relapse‐free survival in breast cancer patients treated with endocrine therapy. In conclusion, thermal proteome profiling identifies the proteasome and ECM29 protein as mediators of palbociclib activity in breast cancer cells. See also: RL de Oliveira \& R Bernards (May 2018) Synopsis \img class="highwire-embed" alt="Embedded Image" src="http://emboj.embopress.org/sites/default/files/highwire/embojnl/37/10/e98359/embed/graphic-1.gif"/\ The breast cancer drug palbociclib arrests cells in G1 phase by CDK4/6 inhibition, but also causes cellular senescence. Thermal proteome profiling shows that the latter is mediated by increased proteasome activation through reduced ECM29 binding. Mass spectrometry‐based cellular thermal shift assay (MS‐CeTSA) analysis of CDK4/6 inhibitor palbociclib targets in MCF7 human breast cancer cells identifies protein complexes including the 20S proteasome.Palbociclib treatment increases proteasome activity independently of the ubiquitin pathway.Palbociclib activates the proteasome by disassociating the proteolysis‐inhibiting scaffold protein ECM29.Proteasome activation is required for palbociclib‐induced cellular senescence, which is sensitive to the proteasome inhibitor bortezomib. The initial kinetochore (KT) encounter with a spindle microtubule (MT; KT capture) is one of the rate-limiting steps in establishing proper KT–MT interaction during mitosis. KT capture is facilitated by multiple factors, such as MT extension in various directions, KT diffusion, and MT pivoting. In addition, KTs generate short MTs, which subsequently interact with a spindle MT. KT-derived MTs may facilitate KT capture, but their contribution is elusive. In this study, we find that Stu1 recruits Stu2 to budding yeast KTs, which promotes MT generation there. By removing Stu2 specifically from KTs, we show that KT-derived MTs shorten the half-life of noncaptured KTs from 48–49 s to 28–34 s. Using computational simulation, we found that multiple factors facilitate KT capture redundantly or synergistically. In particular, KT-derived MTs play important roles both by making a significant contribution on their own and by synergistically enhancing the effects of KT diffusion and MT pivoting. 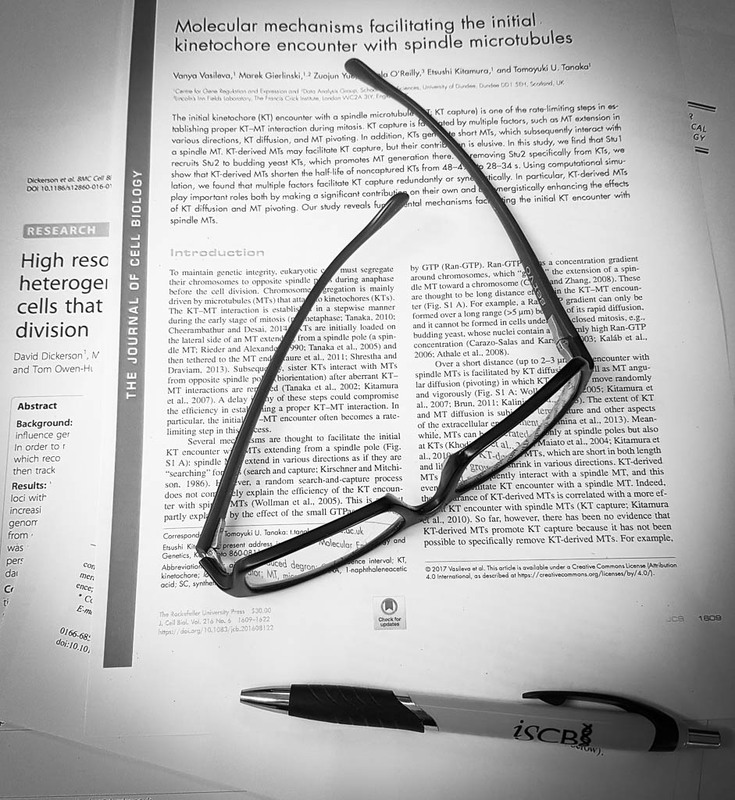 Our study reveals fundamental mechanisms facilitating the initial KT encounter with spindle MTs. Human genome sequencing has generated population variant datasets containing millions of variants from hundreds of thousands of individuals. The datasets show the genomic distribution of genetic variation to be influenced on genic and sub-genic scales by gene essentiality, protein domain architecture and the presence of genomic features such as splice donor/acceptor sites. However, the variant data are still too sparse to provide a comparative picture of genetic variation between individual protein residues in the proteome. Here, we overcome this sparsity for ~25,000 human protein domains in 1,291 domain families by aggregating variants over equivalent positions (columns) in multiple sequence alignments of sequence-similar (paralagous) domains. We then compare the resulting variation profiles from the human population to residue conservation across all species and find that the same tertiary structural and functional pressures that affect amino acid conservation during domain evolution constrain missense variant distributions. Thus, depletion of missense variants at a position implies that it is structurally or functionally important. We find such positions are enriched in known disease-associated variants (OR = 2.83, p ≈ 0) while positions that are both missense depleted and evolutionary conserved are further enriched in disease-associated variants (OR = 1.85, p = 3.3x10-17) compared to those that are only evolutionary conserved (OR = 1.29, p = 4.5x10-19). Unexpectedly, a subset of evolutionary Unconserved positions are Missense Depleted in human (UMD positions) and these are also enriched in pathogenic variants (OR = 1.74, p = 0.02). UMD positions are further differentiated from other unconserved residues in that they are enriched in ligand, DNA and protein binding interactions (OR = 1.59, p = 0.003), which suggests this stratification can identify functionally important positions. A different class of positions that are Conserved and Missense Enriched (CME) show an enrichment of ClinVar risk factor variants (OR = 2.27, p = 0.004). We illustrate these principles with the G-Protein Coupled Receptor (GPCR) family, Nuclear Receptor Ligand Binding Domain family and In Between Ring-Finger (IBR) domains and list a total of 343 UMD positions in 211 domain families. This study will have broad applications to: (a) providing focus for functional studies of specific proteins by mutagenesis; (b) refining pathogenicity prediction models; (c) highlighting which residue interactions to target when refining the specificity of small-molecule drugs. RNA-seq experiments are usually carried out in three or fewer replicates. In order to work well with so few samples, Differential Gene Expression (DGE) tools typically assume the form of the underlying distribution of gene expression. A recent highly replicated study revealed that RNA-seq gene expression measurements in yeast are best represented as being drawn from an underlying negative binomial distribution. In this paper, the statistical properties of gene expression in the higher eukaryote Arabidopsis thaliana are shown to be essentially identical to those from yeast despite the large increase in the size and complexity of the transcriptome: Gene expression measurements from this model plant species are consistent with being drawn from an underlying negative binomial or log-normal distribution and the false positive rate performance of nine widely used DGE tools is not strongly affected by the additional size and complexity of the A. thaliana transcriptome. For RNA-seq data, we therefore recommend the use of DGE tools that are based on the negative binomial distribution. Skip to Next Section Proper chromosome segregation in mitosis relies on correct kinetochore interaction with spindle microtubules. In early mitosis, each kinetochore usually interacts with the lateral side of each microtubule and is subsequently tethered at the microtubule end. However, since eukaryotic cells carry multiple chromosomes, multiple kinetochores could occasionally interact with a single microtubule. The consequence of this is unknown. Here we find that, although two kinetochores (two pairs of sister kinetochores) can interact with the lateral side of one microtubule, only one kinetochore can form sustained attachment to the microtubule end in budding yeast. This leads to detachment of the other kinetochore from the microtubule end or its proximity. Intriguingly, in this context, kinetochore sliding along a microtubule towards a spindle pole delays and diminishes discernible kinetochore detachment. This effect expedites collection of the entire set of kinetochores to a spindle pole. We propose that cells are equipped with the kinetochore sliding mechanism to mitigate the problem with multiple kinetochores on one microtubule in early mitosis. Annotation of gene models and transcripts is a fundamental step in genome sequencing projects. Often this is performed with automated prediction pipelines, which can miss complex and atypical genes or transcripts. RNA sequencing (RNA-seq) data can aid the annotation with empirical data. Here we present de novo transcriptome assemblies generated from RNA-seq data in four Dictyostelid species: D. discoideum, P. pallidum, D. fasciculatum and D. lacteum. The assemblies were incorporated with existing gene models to determine corrections and improvement on a whole-genome scale. This is the first time this has been performed in these eukaryotic species. Coordination of cell movement with cell differentiation is a major feat of embryonic development. The Dictyostelium stalk always forms at the organizing tip, by a mechanism that is not understood. We previously reported that cyclic diguanylate (c-di-GMP), synthesized by diguanylate cyclase A (DgcA), induces stalk formation. Here we used transcriptional profiling of dgca− structures to identify target genes for c-di-GMP, and used these genes to investigate the c-di-GMP signal transduction pathway. We found that knockdown of cAMP-dependent protein kinase (PKA) activity in prestalk cells reduced stalk gene induction by c-di-GMP, whereas PKA activation bypassed the c-di-GMP requirement for stalk gene expression. c-di-GMP caused a persistent increase in cAMP, which still occurred in mutants lacking the adenylate cyclases ACG or ACR, or the cAMP phosphodiesterase RegA. However, both inhibition of adenylate cyclase A (ACA) with SQ22536 and incubation of a temperature-sensitive ACA mutant at the restrictive temperature prevented c-di-GMP–induced cAMP synthesis as well as c-di-GMP–induced stalk gene transcription. ACA produces the cAMP pulses that coordinate Dictyostelium morphogenetic cell movement and is highly expressed at the organizing tip. The stalk-less dgca− mutant regained its stalk by expression of a light-activated adenylate cyclase from the ACA promoter and exposure to light, indicating that cAMP is also the intermediate for c-di-GMP in vivo. Our data show that the more widely expressed DgcA activates tip-expressed ACA, which then acts on PKA to induce stalk genes. These results explain why stalk formation in Dictyostelia always initiates at the site of the morphogenetic organizer. Aspirin, or acetylsalicylic acid is widely used to control pain, inflammation and fever. Important to this function is its ability to irreversibly acetylate cyclooxygenases at active site serines. Aspirin has the potential to acetylate other amino-acid side-chains, leading to the possibility that aspirin-mediated lysine acetylation could explain some of its as-yet unexplained drug actions or side-effects. Using isotopically labeled aspirin-d3, in combination with acetylated lysine purification and LC-MS/MS, we identified over 12000 sites of lysine acetylation from cultured human cells. Although aspirin amplifies endogenous acetylation signals at the majority of detectable endogenous sites, cells tolerate aspirin mediated acetylation very well unless cellular deacetylases are inhibited. Although most endogenous acetylations are amplified by orders of magnitude, lysine acetylation site occupancies remain very low even after high doses of aspirin. This work shows that while aspirin has enormous potential to alter protein function, in the majority of cases aspirin-mediated acetylations do not accumulate to levels likely to elicit biological effects. These findings are consistent with an emerging model for cellular acetylation whereby stoichiometry correlates with biological relevance, and deacetylases act to minimize the biological consequences non-specific chemical acetylations. Congenital abnormalities of the nail are rare conditions that are most frequently associated with congenital ectodermal syndromes involving several of the epidermal appendages including the skin, teeth, hair and nails. Isolated recessive nail dysplasia (IRND) is much rarer but has recently been recognized as a condition resulting in 20-nail dystrophy in the absence of other cutaneous or extracutaneous findings. A few case reports have identified mutations in the Frizzled 6 (FZD6) gene in families presenting with abnormal nails consistent with IRND. These reports have highlighted the role of Wnt–FZD signalling in the process of nail formation. We report three families presenting with features of IRND, in whom we identified mutations in FZD6, including one previously unreported mutation. Genomes of eukaryotes exist as chromatin, and it is known that different chromatin states can influence gene regulation. Chromatin is not a static structure, but is known to be dynamic and vary between cells. In order to monitor the organisation of chromatin in live cells we have engineered fluorescent fusion proteins which recognize specific operator sequences to tag pairs of syntenic gene loci. The separation of these loci was then tracked in three dimensions over time using fluorescence microscopy. Introduction The inherited palmoplantar keratodermas (PPKs) are a heterogeneous group of genodermatoses, characterised by thickening of the epidermis of the palms and soles. No classification system unites satisfactorily clinical presentation, pathology and molecular pathogenesis. There are four patterns of hyperkeratosis: striate, focal, diffuse, and punctate. Mutations in desmoglein-1 (DSG1), a transmembrane glycoprotein, have been reported primarily in striate, but also in focal and diffuse PPKs. Objectives We report seven unrelated pedigrees with dominantly inherited PPK due to mutations in the DSG1 gene, with marked phenotypic variation. Methods Genomic DNA from each family was isolated, and individual exons amplified by polymerase chain reaction (PCR). Sanger sequencing was employed to identify mutations. Results Mutation analysis identified novel mutations in five families (p.Tyr126Hisfs*2, p.Ser521Tyrfs*2, p.Trp3*, p.Asp591Phefs*9 and p.Met249Ilefs*6) with striate palmar involvement and varying focal or diffuse plantar disease, and the recurrent mutation c.76CT, p.Arg26*, in two families with variable PPK patterns. Conclusion We report one recurrent and five novel DSG1 mutations, causing varying patterns of PPK, highlighting the clinical heterogeneity arising from mutations in this gene. This article is protected by copyright. All rights reserved. RNA-seq is now the technology of choice for genome-wide differential gene expression experiments, but it is not clear how many biological replicates are needed to ensure valid biological interpretation of the results or which statistical tools are best for analyzing the data. An RNA-seq experiment with 48 biological replicates in each of two conditions was performed to answer these questions and provide guidelines for experimental design. With three biological replicates, nine of the 11 tools evaluated found only 20%–40% of the significantly differentially expressed (SDE) genes identified with the full set of 42 clean replicates. This rises to 85% for the subset of SDE genes changing in expression by more than fourfold. To achieve 85% for all SDE genes regardless of fold change requires more than 20 biological replicates. The same nine tools successfully control their false discovery rate at ≲5% for all numbers of replicates, while the remaining two tools fail to control their FDR adequately, particularly for low numbers of replicates. For future RNA-seq experiments, these results suggest that at least six biological replicates should be used, rising to at least 12 when it is important to identify SDE genes for all fold changes. If fewer than 12 replicates are used, a superior combination of true positive and false positive performances makes edgeR and DESeq2 the leading tools. For higher replicate numbers, minimizing false positives is more important and DESeq marginally outperforms the other tools. Background: Annotation of gene models and transcripts is a fundamental step in genome sequencing projects. Often this is performed with automated prediction pipelines, which can miss complex and atypical genes or transcripts. RNA-seq data can aid the annotation with empirical data. Here we present de novo transcriptome assemblies generated from RNA-seq data in four Dictyostelid species: D. discoideum, P. pallidum, D. fasciculatum and D. lacteum. The assemblies were incorporated with existing gene models to determine corrections and improvement on a whole-genome scale. This is the first time this has been performed in these eukaryotic species. Results: An initial de novo transcriptome assembly was generated by Trinity for each species and then refined with Program to Assemble Spliced Alignments (PASA). The completeness and quality were assessed with the Core Eukaryotic Genes Mapping Approach (CEGMA) and Transrate tools at each stage of the assemblies. The final datasets of 11,315-12,849 transcripts contained 5,610-7,712 updates and corrections to 50% of existing gene models including changes to hundreds or thousands of protein products. Putative novel genes are also identified and alternative splice isoforms were observed for the first time in P. pallidum, D. lacteum and D. fasciculatum. Conclusions: In taking a whole transcriptome approach to genome annotation with empirical data we have been able to enrich the annotations of four existing genome sequencing projects. In doing so we have identified updates to the majority of the gene annotations across all four species under study and found putative novel genes and transcripts which could be worthy for follow-up. The new transcriptome data we present here will be a valuable resource for genome curators in the Dictyostelia and we propose this effective methodology for use in other genome annotation projects. Motivation: The current generation of DNA sequencing technologies produce a large amount of data quickly. All of these data need to pass some form of quality control processing and checking before they can be used for any analysis. The large number of samples that are run through Illumina sequencing machines makes the process of quality control an onerous and time-consuming task that requires multiple pieces of information from several sources. Results: AlmostSignificant is an open-source platform for aggregating multiple sources of quality metrics as well as meta-data associated with DNA sequencing runs from Illumina sequencing machines. AlmostSignificant is a graphical platform to streamline the quality control of DNA sequencing data, to collect and store these data for future reference and to collect extra meta-data associated with the sequencing runs to check for errors and monitor the volume of data produced by the associated machines. AlmostSignificant has been used to track the quality of over 80 sequencing runs covering over 2500 samples produced over the last three years. Availability: The code and documentation for AlmostSignificant is freely available at https://github.com/bartongroup/AlmostSignificant. Author Summary CTCF is a transcriptional regulator acting as an insulator element interfering with enhancer function and as a boundary between chromatin domains. CTCF has been shown to organise an exquisite array of phased nucleosomes flanking its binding sites. Here we identified SNF2H as the enzyme primarily responsible for organising the extended arrays of nucleosomes adjacent to CTCF sites. We find that SNF2H acts to maintain the occupancy of CTCF at its binding sites, but does not act as a general loading factor for CTCF’s binding partner cohesin. SNF2H’s action at CTCF sites is functionally important as overlapping cohorts of genes are affected by depletion of CTCF or SNF2H. Other transcription factors also organise nucleosomes and we find that the SNF2H and the related enzyme SNF2L contribute to organising nucleosomes at many of these sites. This accessible introductory textbook provides a straightforward, practical explanation of how statistical analysis and error measurements should be applied in biological research. Understanding Statistical Error - A Primer for Biologists: * Introduces the essential topic of error analysis to biologists * Contains mathematics at a level that all biologists can grasp * Presents the formulas required to calculate each confidence interval for use in practice * Is based on a successful series of lectures from the author s established course Assuming no prior knowledge of statistics, this book covers the central topics needed for efficient data analysis, ranging from probability distributions, statistical estimators, confidence intervals, error propagation and uncertainties in linear regression, to advice on how to use error bars in graphs properly. Using simple mathematics, all these topics are carefully explained and illustrated with figures and worked examples. The emphasis throughout is on visual representation and on helping the reader to approach the analysis of experimental data with confidence. This useful guide explains how to evaluate uncertainties of key parameters, such as the mean, median, proportion and correlation coefficient. Crucially, the reader will also learn why confidence intervals are important and how they compare against other measures of uncertainty. Understanding Statistical Error - A Primer for Biologists can be used both by students and researchers to deepen their knowledge and find practical formulae to carry out error analysis calculations. It is a valuable guide for students, experimental biologists and professional researchers in biology, biostatistics, computational biology, cell and molecular biology, ecology, biological chemistry, drug discovery, biophysics, as well as wider subjects within life sciences and any field where error analysis is required. Meesmann epithelial corneal dystrophy (MECD) is a rare autosomal dominant disorder caused by dominant-negative mutations within the KRT3 or KRT12 genes, which encode the cytoskeletal proteins keratin K3 and K12, respectively. To investigate the pathomechanism of this disease we generated and phenotypically characterized a novel knock-in humanised mouse model carrying the severe, MECD-associated, K12-Leu132Pro mutation. Although no overt changes in corneal opacity were detected by slit-lamp examination, the corneas of homozygous mutant mice exhibited histological and ultrastructural epithelial cell fragility phenotypes. An altered keratin expression profile was observed in the cornea of mutant mice, confirmed by Western blot, RNA-seq and qRT-PCR. Mass spectrometry and immunohistochemistry demonstrated a similarly altered keratin profile in corneal tissue from a K12-Leu132Pro MECD patient. The K12-Leu132Pro mutation results in cytoplasmic keratin aggregates. RNA-seq analysis revealed increased chaperone gene expression, while apoptotic unfolded protein response (UPR) markers, CHOP and Caspase 12, were also increased in the MECD mice. Corneal epithelial cell apoptosis was increased 17–fold in the mutant cornea, compared to the wild-type (p0.001). This elevation of UPR marker expression was also observed in the human MECD cornea. This is the first reporting of a mouse model for MECD that recapitulates the human disease, and is a valuable resource in understanding the pathomechanism of the disease. While the most severe phenotype is observed in the homozygous mice, this model will still provide a test-bed for therapies not only for corneal dystrophies but also for other keratinopathies caused by similar mutations. Background Severe dermatitis, multiple allergies, and metabolic wasting (SAM) syndrome is a recently recognized syndrome caused by mutations in the desmoglein 1 gene (DSG1). To date, only 3 families have been reported. Objective We studied a new case of SAM syndrome known to have no mutations in DSG1 to detail the clinical, histopathologic, immunofluorescent, and ultrastructural phenotype and to identify the underlying molecular mechanisms in this rare genodermatosis. Methods Histopathologic, electron microscopy, and immunofluorescent studies were performed. Whole-exome sequencing data were interrogated for mutations in desmosomal and other skin structural genes, followed by Sanger sequencing of candidate genes in the patient and his parents. Results No mutations were identified in DSG1; however, a novel de novo heterozygous missense c.1757AC mutation in the desmoplakin gene (DSP) was identified in the patient, predicting the amino acid substitution p.His586Pro in the desmoplakin polypeptide. Conclusions SAM syndrome can be caused by mutations in both DSG1 and DSP. Knowledge of this genetic heterogeneity is important for both analysis of patients and genetic counseling of families. This condition and these observations reinforce the importance of heritable skin barrier defects, in this case desmosomal proteins, in the pathogenesis of atopic disease. Hereditary Fibrosing Poikiloderma (HFP) with tendon contractures, myopathy and pulmonary fibrosis (POIKTMP [MIM 615704]) is a very recently described entity of syndromic inherited poikiloderma. Previously by using whole exome sequencing in five families, we identified the causative gene, FAM111B (NM\_198947.3), the function of which is still unknown. Our objective in this study was to better define the specific features of POIKTMP through a larger series of patients. Macrophages are important immune cells operating at the forefront of innate immunity by taking up foreign particles and microbes through phagocytosis. The RAW 264.7 cell line is commonly used for experiments in the macrophage and phagocytosis field. However, little is known how its functions compare to primary macrophages. Here, we have performed an in-depth proteomics characterization of phagosomes from RAW 264.7 and bone marrow derived macrophages by quantifying more than 2500 phagosomal proteins. Our data indicate that there are significant differences for a large number of proteins including important receptors such as mannose receptor 1 and Siglec-1. Moreover, bone marrow derived macrophages phagosomes mature considerably faster by fusion with endosomes and the lysosome which we validated using fluorogenic phagocytic assays. We provide a valuable resource for researcher in the field and recommend careful use of the RAW 264.7 cell line when studying phagosome functions. All MS data have been deposited in the ProteomeXchange with identifier PXD001293 (http:/roteomecentral.proteomexchange.org/dataset/PXD001293). SUMO-2 to the rescue In response to various proteotoxic stresses, such as heat shock or accumulation of misfolded proteins, cells activate protective mechanisms that depend on the production and function of heat shock proteins (HSPs) and other protein chaperones. Seifert et al. found that in response to various proteotoxic stresses, chromatin-associated proteins at sites of active genes were conjugated to SUMO-2 (small ubiquitin-like modifier 2) proteins. Rather than stimulate or repress target gene expression, conjugation with SUMO-2 enhanced the stability of protein complexes at transcription start sites, thus enabling cells to first withstand the initial effects of stress and express genes encoding HSPs and the other factors required for cell survival. The small ubiquitin-like modifier 2 (SUMO-2) is required for survival when cells are exposed to treatments that induce proteotoxic stress by causing the accumulation of misfolded proteins. Exposure of cells to heat shock or other forms of proteotoxic stress induces the conjugation of SUMO-2 to proteins in the nucleus. We investigated the chromatin landscape of SUMO-2 modifications in response to heat stress. Through chromatin immunoprecipitation assays coupled to high-throughput DNA sequencing and mRNA sequencing, we showed that in response to heat shock, SUMO-2 accumulated at nucleosome-depleted, active DNA regulatory elements, which represented binding sites for large protein complexes and were predominantly associated with active genes. However, SUMO did not act as a direct transcriptional repressor or activator of these genes during heat shock. Instead, integration of our results with published proteomics data on heat shock–induced SUMO-2 substrates supports a model in which the conjugation of SUMO-2 to proteins acts as an acute stress response that is required for the stability of protein complexes involved in gene expression and posttranscriptional modification of mRNA. We showed that the conjugation of SUMO-2 to chromatin-associated proteins is an integral component of the proteotoxic stress response, and propose that SUMO-2 fulfills its essential role in cell survival by contributing to the maintenance of protein complex homeostasis. Cells use SUMO-2 to stabilize chromatin-associated proteins and cope with stress. Cells use SUMO-2 to stabilize chromatin-associated proteins and cope with stress. Calpastatin is an endogenous specific inhibitor of calpain, a calcium-dependent cysteine protease. Here we show that loss-of-function mutations in calpastatin (CAST) are the genetic causes of an autosomal-recessive condition characterized by generalized peeling skin, leukonychia, acral punctate keratoses, cheilitis, and knuckle pads, which we propose to be given the acronym PLACK syndrome. In affected individuals with PLACK syndrome from three families of different ethnicities, we identified homozygous mutations (c.607dup, c.424AT, and c.1750delG) in CAST, all of which were predicted to encode truncated proteins (p.Ile203Asnfs∗8, p.Lys142∗, and p.Val584Trpfs∗37). Immunohistochemistry shows that staining of calpastatin is reduced in skin from affected individuals. Transmission electron microscopy revealed widening of intercellular spaces with chromatin condensation and margination in the upper stratum spinosum in lesional skin, suggesting impaired intercellular adhesion as well as keratinocyte apoptosis. A significant increase of apoptotic keratinocytes was also observed in TUNEL assays. In vitro studies utilizing siRNA-mediated CAST knockdown revealed a role for calpastatin in keratinocyte adhesion. In summary, we describe PLACK syndrome, as a clinical entity of defective epidermal adhesion, caused by loss-of-function mutations in CAST. Macrophages operate at the forefront of innate immunity and their discrimination of foreign versus “self” particles is critical for a number of responses including efficient pathogen killing, antigen presentation, and cytokine induction. In order to efficiently destroy the particles and detect potential threats, macrophages express an array of receptors to sense and phagocytose prey particles. In this study, we accurately quantified a proteomic time-course of isolated phagosomes from murine bone marrow-derived macrophages induced by particles conjugated to seven different ligands representing pathogen-associated molecular patterns, immune opsonins or apoptotic cell markers. We identified a clear functional differentiation over the three timepoints and detected subtle differences between certain ligand-phagosomes, indicating that triggering of receptors through a single ligand type has mild, but distinct, effects on phagosome proteome and function. Moreover, our data shows that uptake of phosphatidylserine-coated beads induces an active repression of NF-κB immune responses upon Toll-like receptor (TLR)-activation by recruitment of anti-inflammatory regulators to the phagosome. This data shows for the first time a systematic time-course analysis of bone marrow-derived macrophages phagosomes and how phagosome fate is regulated by the receptors triggered for phagocytosis. High-throughput RNA sequencing (RNA-seq) is now the standard method to determine differential gene expression. Identifying differentially expressed genes crucially depends on estimates of read count variability. These estimates are typically based on statistical models such as the negative binomial distribution, which is employed by the tools edgeR, DESeq and cuffdiff. Until now, the validity of these models has usually been tested on either low-replicate RNA-seq data or simulations. A 48-replicate RNA-seq experiment in yeast was performed and data tested against theoretical models. The observed gene read counts were consistent with both log-normal and negative binomial distributions, while the mean-variance relation followed the line of constant dispersion parameter of ~0.01. The high-replicate data also allowed for strict quality control and screening of bad replicates, which can drastically affect the gene read-count distribution. RNA-seq data have been submitted to ENA archive with project ID PRJEB5348. An RNA-seq experiment with 48 biological replicates in each of 2 conditions was performed to determine the number of biological replicates (\$n\_r\$) required, and to identify the most effective statistical analysis tools for identifying differential gene expression (DGE). When \$n\_r=3\$, seven of the nine tools evaluated give true positive rates (TPR) of only 20 to 40 percent. For high fold-change genes (\$textbarlog\_\2\(FC)textbartextbackslashgt2\$) the TPR is \$textbackslashgt85\$ percent. Two tools performed poorly; over- or under-predicting the number of differentially expressed genes. Increasing replication gives a large increase in TPR when considering all DE genes but only a small increase for high fold-change genes. Achieving a TPR \$textbackslashgt85\$% across all fold-changes requires \$n\_rtextbackslashgt20\$. For future RNA-seq experiments these results suggest \$n\_rtextbackslashgt6\$, rising to \$n\_rtextbackslashgt12\$ when identifying DGE irrespective of fold-change is important. For \$n\_rtextbackslashgt12\$, superior TPR makes edgeR the leading tool tested. For \$n\_r textbackslashge12\$, minimizing false positives is more important and DESeq outperforms the other tools. Motivation: The 14-3-3 family of phosphoprotein-binding proteins regulate many cellular processes by docking onto pairs of phosphorylated Ser and Thr residues in a constellation of intracellular targets. Therefore, there is a pressing need to develop new prediction methods that use an updated set of 14-3-3-binding motifs for the identification of new 14-3-3 targets, and to prioritize the downstream analysis of 2000 potential interactors identified in high-throughput experiments. Results: Here, a comprehensive set of 14-3-3-binding targets from the literature was used to develop 14-3-3-binding phosphosite predictors. Position-specific scoring matrix (PSSM), support vector machines (SVM), and artificial neural network (ANN) classification methods were trained to discriminate experimentally-determined 14-3-3-binding motifs from non-binding phosphopeptides. ANN, PSSM and SVM methods showed best performance for a motif window spanning from -6 to +4 around the binding phosphosite, achieving Matthews correlation coefficient of up to 0.60. Blind prediction showed that all three methods outperform two popular 14-3-3-binding site predictors, Scansite and ELM. The new methods were used for prediction of 14-3-3-binding phosphosites in the human proteome. Experimental analysis of high-scoring predictions in the FAM122A and FAM122B proteins confirms the predictions and suggests the new 14-3-3-predictors will be generally useful. Availability: A standalone prediction webserver is available at http://www.compbio.dundee.ac.uk/1433pred. Human candidate 14-3-3-binding phosphosites were integrated in ANIA: ANnotation and Integrated Analysis of the 14-3-3 interactome database. Contact: cmackintosh@dundee.ac.uk and gjbarton@dundee.ac.uk Supplementary information: Supplementary data are available at Bioinformatics online. BACKGROUND: Diagnosis of human African trypanosomiasis (HAT) remains a challenge both for active screening, which is critical in control of the disease, and in the point-of-care scenario where early and accurate diagnosis is essential. Recently, the first field deployment of a lateral flow rapid diagnostic test (RDT) for HAT, "SD BIOLINE HAT" has taken place. In this study, we evaluated the performance of "SD BIOLINE HAT" and two new prototype RDTs. METHODOLOGY/PRINCIPAL FINDINGS: The performance of "SD BIOLINE HAT" and 2 prototype RDTs was tested using archived plasma from 250 Trypanosoma brucei gambiense patients, and 250 endemic controls. As well as comparison of the sensitivity and specificity of each device, the performance of individual antigens was assessed and the hypothetical performance of novel antigen combinations extrapolated. Neither of the prototype devices were inferior in sensitivity or specificity to "SD BIOLINE HAT" (sensitivity 0.82±0.01, specificity 0.97±0.01, 95% CI) at the 5% margins, while one of the devices (BBI) had significantly superior sensitivity (0.88±0.03). Analysis of the performance of individual antigens was used to model new antigen combinations to be explored in development of the next generation of HAT RDTs. The modelling showed that an RDT using two recombinant antigens (rLiTat1.5 and rISG65) would give a performance similar to the best devices in this study, and would also offer the most robust performance under deteriorating field conditions. CONCLUSIONS/SIGNIFICANCE: Both "SD BIOLINE HAT" and the prototype devices performed comparably well to one another and also to the published performance range of the card agglutination test for trypanosomiasis in sensitivity and specificity. The performance of individual antigens enabled us to predict that an all-recombinant antigen RDT can be developed with an accuracy equivalent to " SD BIOLINE HAT." Such an RDT would have advantages in simplified manufacture, lower unit cost and assured reproducibility. Here, we exploit the spatial separation of temporal events of neural differentiation in the elongating chick body axis to provide the first analysis of transcriptome change in progressively more differentiated neural cell populations in vivo. Microarray data, validated against direct RNA sequencing, identified: (1) a gene cohort characteristic of the multi-potent stem zone epiblast, which contains neuro-mesodermal progenitors that progressively generate the spinal cord; (2) a major transcriptome re-organisation as cells then adopt a neural fate; and (3) increasing diversity as neural patterning and neuron production begin. Focussing on the transition from multi-potent to neural state cells, we capture changes in major signalling pathways, uncover novel Wnt and Notch signalling dynamics, and implicate new pathways (mevalonate pathway/steroid biogenesis and TGFβ). This analysis further predicts changes in cellular processes, cell cycle, RNA-processing and protein turnover as cells acquire neural fate. We show that these changes are conserved across species and provide biological evidence for reduced proteasome efficiency and a novel lengthening of S phase. This latter step may provide time for epigenetic events to mediate large-scale transcriptome re-organisation; consistent with this, we uncover simultaneous downregulation of major chromatin modifiers as the neural programme is established. We further demonstrate that transcription of one such gene, HDAC1, is dependent on FGF signalling, making a novel link between signals that control neural differentiation and transcription of a core regulator of chromatin organisation. Our work implicates new signalling pathways and dynamics, cellular processes and epigenetic modifiers in neural differentiation in vivo, identifying multiple new potential cellular and molecular mechanisms that direct differentiation. Background Atopic dermatitis (AD; eczema) is characterized by a widespread abnormality in cutaneous barrier function and propensity to inflammation. Filaggrin is a multifunctional protein and plays a key role in skin barrier formation. Loss-of-function mutations in the gene encoding filaggrin (FLG) are a highly significant risk factor for atopic disease, but the molecular mechanisms leading to dermatitis remain unclear. Objective We sought to interrogate tissue-specific variations in the expressed genome in the skin of children with AD and to investigate underlying pathomechanisms in atopic skin. Methods We applied single-molecule direct RNA sequencing to analyze the whole transcriptome using minimal tissue samples. Uninvolved skin biopsy specimens from 26 pediatric patients with AD were compared with site-matched samples from 10 nonatopic teenage control subjects. Cases and control subjects were screened for FLG genotype to stratify the data set. Results Two thousand four hundred thirty differentially expressed genes (false discovery rate, P \&lt; .05) were identified, of which 211 were significantly upregulated and 490 downregulated by greater than 2-fold. Gene ontology terms for “extracellular space” and “defense response” were enriched, whereas “lipid metabolic processes” were downregulated. The subset of FLG wild-type cases showed dysregulation of genes involved with lipid metabolism, whereas filaggrin haploinsufficiency affected global gene expression and was characterized by a type 1 interferon–mediated stress response. Conclusion These analyses demonstrate the importance of extracellular space and lipid metabolism in atopic skin pathology independent of FLG genotype, whereas an aberrant defense response is seen in subjects with FLG mutations. Genotype stratification of the large data set has facilitated functional interpretation and might guide future therapy development. The reference annotations made for a genome sequence provide the framework for all subsequent analyses of the genome. Correct and complete annotation in addition to the underlying genomic sequence is particularly important when interpreting the results of RNA-seq experiments where short sequence reads are mapped against the genome and assigned to genes according to the annotation. Inconsistencies in annotations between the reference and the experimental system can lead to incorrect interpretation of the effect on RNA expression of an experimental treatment or mutation in the system under study. Until recently, the genome-wide annotation of 3′ untranslated regions received less attention than coding regions and the delineation of intron/exon boundaries. In this paper, data produced for samples in Human, Chicken and A. thaliana by the novel single-molecule, strand-specific, Direct RNA Sequencing technology from Helicos Biosciences which locates 3′ polyadenylation sites to within +/− 2 nt, were combined with archival EST and RNA-Seq data. Nine examples are illustrated where this combination of data allowed: (1) gene and 3′ UTR re-annotation (including extension of one 3′ UTR by 5.9 kb); (2) disentangling of gene expression in complex regions; (3) clearer interpretation of small RNA expression and (4) identification of novel genes. While the specific examples displayed here may become obsolete as genome sequences and their annotations are refined, the principles laid out in this paper will be of general use both to those annotating genomes and those seeking to interpret existing publically available annotations in the context of their own experimental data. Krüppel-like factor 2 (KLF2) is a transcription factor that is highly expressed in quiescent T lymphocytes and downregulated in effector T cells. We now show that antigen receptor engagement downregulates KLF2 expression in a graded response determined by the affinity of T cell antigen receptor (TCR) ligand and the integrated activation of protein kinase B and the MAP kinases ERK1/2. The present study explores the importance of KLF2 downregulation and reveals that the loss of KLF2 controls a select portion of the CD8 effector T cell transcriptional program. In particular, KLF2 loss is required for CD8 T cells to express the inflammatory chemokine receptor CXCR3 and for maximum clonal expansion of T cells. KLF2 thus negatively controls the ability of CD8 T cells to respond to the CXCR3 ligand CXCL10. Strikingly, the KLF2 threshold for restraining expression of CXCR3 is very low and quite distinct to the KLF2 threshold for restraining T cell proliferation. KLF2 is thus an analogue (tunable) not a digital (on/off) cellular switch where the magnitude of KLF2 expression differentially modifies the T cell responses. Author SummaryThe ends of almost all eukaryotic protein-coding genes are defined by a poly(A) signal. When genes are transcribed into mRNA by RNA polymerase II, the poly(A) signal guides cleavage of the precursor mRNA at a particular site; this is accompanied by the addition of a poly(A) tail to the mRNA and termination of transcription. Many genes have more than one poly(A) signal and the regulated choice of which to select can effectively determine what the gene will code for, how the gene can be regulated and where transcription termination occurs. We discovered a rare example of a regulator of poly(A) site choice, called FPA, while studying flower development in the model plant Arabidopsis thaliana. Studying FPA therefore provides an opportunity to understand not only its roles in plant biology but also the generic consequences of disrupting alternative polyadenylation. In this study, we use a technique called direct RNA sequencing to quantify genome-wide shifts in poly(A) site selection in plants that lack FPA function. One of our most striking findings is that in the absence of FPA we detect chimeric RNAs formed between two otherwise separate and well-characterised genes. Centromeres play several important roles in ensuring proper chromosome segregation. Not only do they promote kinetochore assembly for microtubule attachment, but they also support robust sister chromatid cohesion at pericentromeres and facilitate replication of centromeric DNA early in S phase. However, it is still elusive how centromeres orchestrate all these functions at the same site. Here, we show that the budding yeast Dbf4-dependent kinase (DDK) accumulates at kinetochores in telophase, facilitated by the Ctf19 kinetochore complex. This promptly recruits Sld3-Sld7 replication initiator proteins to pericentromeric replication origins so that they initiate replication early in S phase. Furthermore, DDK at kinetochores independently recruits the Scc2-Scc4 cohesin loader to centromeres in G1 phase. This enhances cohesin loading and facilitates robust pericentromeric cohesion in S phase. Thus, we have found the central mechanism by which kinetochores orchestrate early S phase DNA replication and robust sister chromatid cohesion at microtubule attachment sites. Palmoplantar keratodermas (PPKs) are a group of disorders that are diagnostically and therapeutically problematic in dermatogenetics. Punctate PPKs are characterized by circumscribed hyperkeratotic lesions on the palms and soles with considerable heterogeneity. In 18 families with autosomal dominant punctate PPK, we report heterozygous loss-of-function mutations in AAGAB, encoding α- and γ-adaptin–binding protein p34, located at a previously linked locus at 15q22. α- and γ-adaptin–binding protein p34, a cytosolic protein with a Rab-like GTPase domain, was shown to bind both clathrin adaptor protein complexes, indicating a role in membrane trafficking. Ultrastructurally, lesional epidermis showed abnormalities in intracellular vesicle biology. Immunohistochemistry showed hyperproliferation within the punctate lesions. Knockdown of AAGAB in keratinocytes led to increased cell division, which was linked to greatly elevated epidermal growth factor receptor (EGFR) protein expression and tyrosine phosphorylation. We hypothesize that p34 deficiency may impair endocytic recycling of growth factor receptors such as EGFR, leading to increased signaling and cellular proliferation. To prevent re-replication of DNA in a single cell cycle, the licensing of replication origins by Mcm2-7 is prevented during S and G2 phases. Animal cells achieve this by cell-cycle-regulated proteolysis of the essential licensing factor Cdt1 and inhibition of Cdt1 by geminin. Here we investigate the consequences of ablating geminin in synchronised human U2OS cells. Following geminin loss, cells complete an apparently normal S phase, but a proportion arrest at the G2-M boundary. When Cdt1 accumulates in these cells, DNA re-replicates, suggesting that the key role of geminin is to prevent re-licensing in G2. If cell cycle checkpoints are inhibited in cells lacking geminin, cells progress through mitosis and less re-replication occurs. Checkpoint kinases thereby amplify re-replication into an all-or-nothing response by delaying geminin-depleted cells in G2. Deep DNA sequencing revealed no preferential re-replication of specific genomic regions after geminin depletion. This is consistent with the observation that cells in G2 have lost their replication timing information. By contrast, when Cdt1 is overexpressed or is stabilised by the neddylation inhibitor MLN4924, re-replication can occur throughout S phase. Transcription of genes can be discontinuous, occurring in pulses or bursts. It is not clear how properties of transcriptional pulses vary between different genes. We compared the pulsing of five housekeeping and five developmentally induced genes by direct imaging of single gene transcriptional events in individual living Dictyostelium cells. Each gene displayed its own transcriptional signature, differing in probability of firing and pulse duration, frequency, and intensity. In contrast to the prevailing view from both prokaryotes and eukaryotes that transcription displays binary behavior, strongly expressed housekeeping genes altered the magnitude of their transcriptional pulses during development. These nonbinary "tunable" responses may be better suited than stochastic switch behavior for housekeeping functions. Analysis of RNA synthesis kinetics using fluorescence recovery after photobleaching implied modulation of housekeeping-gene pulse strength occurs at the level of transcription initiation rather than elongation. In addition, disparities between single cell and population measures of transcript production suggested differences in RNA stability between gene classes. Analysis of stability using RNAseq revealed no major global differences in stability between developmental and housekeeping transcripts, although strongly induced RNAs showed unusually rapid decay, indicating tight regulation of expression. Measuring the properties of endogenous cell proteins, such as expression level, subcellular localization, and turnover rates, on a whole proteome level remains a major challenge in the postgenome era. Quantitative methods for measuring mRNA expression do not reliably predict corresponding protein levels and provide little or no information on other protein properties. Here we describe a combined pulse-labeling, spatial proteomics and data analysis strategy to characterize the expression, localization, synthesis, degradation, and turnover rates of endogenously expressed, untagged human proteins in different subcellular compartments. Using quantitative mass spectrometry and stable isotope labeling with amino acids in cell culture, a total of 80,098 peptides from 8,041 HeLa proteins were quantified, and their spatial distribution between the cytoplasm, nucleus and nucleolus determined and visualized using specialized software tools developed in PepTracker. Using information from ion intensities and rates of change in isotope ratios, protein abundance levels and protein synthesis, degradation and turnover rates were calculated for the whole cell and for the respective cytoplasmic, nuclear, and nucleolar compartments. Expression levels of endogenous HeLa proteins varied by up to seven orders of magnitude. The average turnover rate for HeLa proteins was ~20 h. Turnover rate did not correlate with either molecular weight or net charge, but did correlate with abundance, with highly abundant proteins showing longer than average half-lives. Fast turnover proteins had overall a higher frequency of PEST motifs than slow turnover proteins but no general correlation was observed between amino or carboxyl terminal amino acid identities and turnover rates. A subset of proteins was identified that exist in pools with different turnover rates depending on their subcellular localization. This strongly correlated with subunits of large, multiprotein complexes, suggesting a general mechanism whereby their assembly is controlled in a different subcellular location to their main site of function. The tumor suppressor phosphatase and tensin homolog deleted on chromosome 10 (PTEN) has a well-characterized lipid phosphatase activity and a poorly characterized protein phosphatase activity. We show that both activities are required for PTEN to inhibit cellular invasion and to mediate most of its largest effects on gene expression. PTEN appears to dephosphorylate itself at threonine 366, and mutation of this site makes lipid phosphatase activity sufficient for PTEN to inhibit invasion. We propose that the dominant role for PTEN's protein phosphatase activity is autodephosphorylation-mediated regulation of its lipid phosphatase activity. Because PTEN's regulation of invasion and these changes in gene expression required lipid phosphatase activity, but did not correlate with the total cellular abundance of its phosphatidylinositol 3,4,5-trisphosphate (PIP₃) lipid substrate or AKT activity, we propose that localized PIP₃ signaling may play a role in those PTEN-mediated processes that depend on both its protein and lipid phosphatase activities. Finally, we identified a tumor-derived PTEN mutant selectively lacking protein phosphatase activity, indicating that in some circumstances the regulation of invasion and not that of AKT can correlate with PTEN-mediated tumor suppression. How kinetochores regulate microtubule dynamics to ensure proper kinetochore-microtubule interactions is unknown. Here, we studied this during early mitosis in Saccharomyces cerevisiae. When a microtubule shrinks and its plus end reaches a kinetochore bound to its lateral surface, the microtubule end attempts to tether the kinetochore. This process often fails and, responding to this failure, microtubule rescue (conversion from shrinkage to growth) occurs, preventing kinetochore detachment from the microtubule end. This rescue is promoted by Stu2 transfer (ortholog of vertebrate XMAP215/ch-TOG) from the kinetochore to the microtubule end. Meanwhile, microtubule rescue distal to the kinetochore is also promoted by Stu2, which is transported by a kinesin-8 motor Kip3 along the microtubule from the kinetochore. Microtubule extension following rescue facilitates interaction with other widely scattered kinetochores, diminishing long delays in collecting the complete set of kinetochores by microtubules. Thus, kinetochore-dependent microtubule rescue ensures efficient and sustained kinetochore-microtubule interactions in early mitosis. In order to gain insight into the function of the Saccharomyces cerevisiae SWI/SNF complex, we have identified DNA sequences to which it is bound genomewide. One surprising observation is that the complex is enriched at the centromeres of each chromosome. Deletion of the gene encoding the Snf2 subunit of the complex was found to cause partial redistribution of the centromeric histone variant Cse4 to sites on chromosome arms. Cultures of snf2Δ yeast were found to progress through mitosis slowly. This was dependent on the mitotic checkpoint protein Mad2. In the absence of Mad2, defects in chromosome segregation were observed. In the absence of Snf2, chromatin organisation at centromeres is less distinct. In particular, hypersensitive sites flanking the Cse4 containing nucleosomes are less pronounced. Furthermore, SWI/SNF complex was found to be especially effective in the dissociation of Cse4 containing chromatin in vitro. This suggests a role for Snf2 in the maintenance of point centromeres involving the removal of Cse4 from ectopic sites. Here we report an unbiased analysis of the cytotoxic T lymphocyte (CTL) serine-threonine phosphoproteome by high-resolution mass spectrometry. We identified approximately 2,000 phosphorylations in CTLs, of which approximately 450 were controlled by T cell antigen receptor (TCR) signaling. A significantly overrepresented group of molecules identified included transcription activators, corepressors and chromatin regulators. A focus on chromatin regulators showed that CTLs had high expression of the histone deacetylase HDAC7 but continually phosphorylated and exported this transcriptional repressor from the nucleus. Dephosphorylation of HDAC7 resulted in its accumulation in the nucleus and suppressed expression of genes encoding key cytokines, cytokine receptors and adhesion molecules that determine CTL function. Screening of the CTL phosphoproteome has thus identified intrinsic pathways of serine-threonine phosphorylation that target chromatin regulators and determine the CTL functional program. The nuclear space is mostly occupied by chromosome territories and nuclear bodies. Although this organization of chromosomes affects gene function, relatively little is known about the role of nuclear bodies in the organization of chromosomal regions. The nucleolus is the best-studied subnuclear structure and forms around the rRNA repeat gene clusters on the acrocentric chromosomes. In addition to rDNA, other chromatin sequences also surround the nucleolar surface and may even loop into the nucleolus. These additional nucleolar-associated domains (NADs) have not been well characterized. We present here a whole-genome, high-resolution analysis of chromatin endogenously associated with nucleoli. We have used a combination of three complementary approaches, namely fluorescence comparative genome hybridization, high-throughput deep DNA sequencing and photoactivation combined with time-lapse fluorescence microscopy. The data show that specific sequences from most human chromosomes, in addition to the rDNA repeat units, associate with nucleoli in a reproducible and heritable manner. NADs have in common a high density of AT-rich sequence elements, low gene density and a statistically significant enrichment in transcriptionally repressed genes. Unexpectedly, both the direct DNA sequencing and fluorescence photoactivation data show that certain chromatin loci can specifically associate with either the nucleolus, or the nuclear envelope. Deep sequencing technologies such as Illumina, SOLiD, and 454 platforms have become very powerful tools in discovering and quantifying small RNAs in diverse organisms. Sequencing small RNA fractions always identifies RNAs derived from abundant RNA species such as rRNAs, tRNAs, snRNA, and snoRNA, and they are widely considered to be random degradation products. We carried out bioinformatic analysis of deep sequenced HeLa RNA and after quality filtering, identified highly abundant small RNA fragments, derived from mature tRNAs that are likely produced by specific processing rather than from random degradation. Moreover, we showed that the processing of small RNAs derived from tRNAGln is dependent on Dicer in vivo and that Dicer cleaves the tRNA in vitro. Jpred (http://www.compbio.dundee.ac.uk/jpred) is a secondary structure prediction server powered by the Jnet algorithm. Jpred performs over 1000 predictions per week for users in more than 50 countries. The recently updated Jnet algorithm provides a three-state (α-helix, β-strand and coil) prediction of secondary structure at an accuracy of 81.5%. Given either a single protein sequence or a multiple sequence alignment, Jpred derives alignment profiles from which predictions of secondary structure and solvent accessibility are made. The predictions are presented as coloured HTML, plain text, PostScript, PDF and via the Jalview alignment editor to allow flexibility in viewing and applying the data. The new Jpred 3 server includes significant usability improvements that include clearer feedback of the progress or failure of submitted requests. Functional improvements include batch submission of sequences, summary results via email and updates to the search databases. A new software pipeline will enable Jnet/Jpred to continue to be updated in sync with major updates to SCOP and UniProt and so ensures that Jpred 3 will maintain high-accuracy predictions.